but what about the people who should be watching their backs? This section of OFFICIAL Wise Monkeys details the information and evidence associated with a concerted campaign which challenged the BBC's ongoing and deliberate cover up of the true facts of 9/11. The BBC is one of the most trusted and respected media networks around the world. However, on the issue of 9/11, the BBC has been proven to have not only refused to show vital facts and scientific evidence about 9/11, it has actively sought to smear and discredit those individuals and organisations who have attempted to bring these facts and evidence forwards. The 9/11 truth movement has not asked the BBC to tell the public that 9/11 was an inside job or to even attempt to suggest what really did happen on 9/11. All the 9/11 truth movement has asked the BBC to do is to do its job and put forwards the true and abundant scientific evidence about 9/11, and let the public make up their own minds from there. This evidence has come from numerous highly professional and credible sources as well as from the physical evidence provided from the official 9/11 investigation itself. However, the BBC has simply refused to show this information to the public and has instead chosen to attack and discredit the 9/11 truth movement and the evidence it has brought forwards which quite simply makes the official story of 9/11 a physical impossibility. The BBC is not the only mainstream media outlet to have chosen to cover up the true facts and evidence of 9/11. Every other mainstream/corporate media outlet in the western world has done exactly the same thing because they are all owned and controlled by just half a dozen giant corporate leaders. It would seem that this handful of corporate giants have a very strong desire and capability for the true evidence of 9/11 to be withheld from the public. However, the BBC is unique amongst these mainstream media outlets, which is the reason that OFFICIAL Wise Monkeys decided to challenge this particular media outlet in the mass corporate media cover up of 9/11 truth. The BBC is unique in that it is funded by the British public through a public licensing fee and government funding. Because it is a publicly funded network rather than a privately owned corporation, it is unique in that it must operate according to a 'Royal Charter' and 'Agreement'. This 'Royal Charter' and 'Agreement' requires the BBC to present news stories to the public in a manner that is accurate, impartial, and fair. If a member of the public feels that the BBC has failed to meet these requirements on a particular news item then there is a formal complaints procedure which the public can use to challenge the BBC. The BBC must be seen to adequately address a complaint put forwards by the public, and for this purpose the BBC has a division called the 'Editorial Standards Committee' which can assess a complaint and determine whether the BBC has been in breach of its operating standards. Over the past few years the BBC has run a number of documentaries about 9/11. Many of these documentaries have been focussed specifically on the 9/11 truth movement to challenge why so many people are questioning the official story. In September 2011, as part of the tenth anniversary of 9/11, the BBC decided to take an increasingly aggressive and biased approach towards the 9/11 truth movement. It ran two documentaries about 9/11 and aimed both of them directly at attempting to debunk the 9/11 truth movement and to attempt to show the people who question the official story of 9/11 to be 'crazy conspiracy theorists'. Rather than putting these two documentaries forward in an accurate, impartial, and fair manner as they are legally required to do by their own 'Editorial Guidelines', they instead aimed these documentaries fairly and squarely at debunking and squashing the 9/11 truth movement. This is despite the overwhelming scientific evidence and factual information backing up these claims by the 9/11 truth movement, and despite the BBC's own reports that at least one third of the population in the UK now have doubts about the official version of events of 9/11. These two documentaries were so hugely biased towards supporting the official 9/11 story and making the so called 'conspiracy theorists' look like naïve crazy people, that three individuals from the UK lodged complaints with the BBC through their formal complaints process. All the subsequent correspondence and scientific evidence provided through that complaints process is documented here for people to see for themselves. “you would think that a science graduate would be more rational”. The so called evidence that was produced in that documentary to attempt to discredit the 9/11 truth movement was quite incredible to say the least. It used a series of crude 'party tricks' to attempt to reinforce the impossible official story and to attempt to discredit the masses of detailed scientific evidence from numerous high level scientists and other professionals in the field. At the same time, the BBC completely ignored absolutely bombshell admissions and evidence such as the admission in 2008 by NIST (National Institute of Standards and Technology), which carried out the official investigation into the collapse of the three towers. 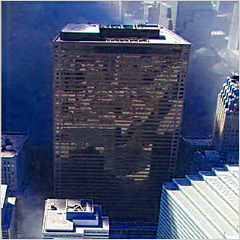 In 2008, due to the incontrovertible scientific evidence gathered by these numerous scientists and professional architects and engineers, NIST was forced to significantly alter their official conclusions about the collapse of World Trade Centre Building 7 and admit that it did in fact collapse at free fall speed for at least part of its collapse. 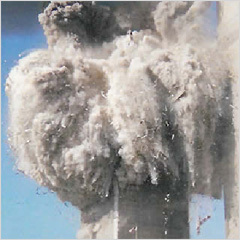 It is a scientific fact which no one has even attempted to dispute, including NIST themselves, that the only way a high rise tower can collapse at free fall speed is by controlled explosive demolition. Just stop for a moment and consider the enormity of what has just been stated here! The link here shows a 30 second video of the collapse of WTC Building 7 shown by CNN on the day of 9/11 with veteran CNN reporter Dan Rather describing it as “reminiscent of a controlled demolition using well placed dynamite”. The collapse of WTC Building 7 has virtually never been shown again by mainstream media in the 11 years since then and NIST's admission of Free Fall has never been covered on mainstream corporate media. Instead of looking at this bombshell issue that brings with it such mind boggling implications, the BBC instead produced a series of crude imitations of science such as using a Lego tower to demonstrate how the official story of the collapse of the Twin Towers was somehow scientifically correct, smashing eggs into the ground and throwing pebbles into piles of flour to 'prove' that the official version of events at Shanksville was correct. There was absolutely no mention of the fact that the official version of the collapse of the three towers was in breach of the basic laws of physics on numerous levels, as proven in detail by the scientists in the 9/11 truth movement. Most of the BBC's other attempts at propping up the official story of 9/11 in these documentaries was equally as biased and factually implausible. In addition, the BBC even stated at the end of their documentary 'Conspiracy Files: 9/11 ten years on' that the individuals within the 9/11 truth movement were adding to the pain of the families of the victims of 9/11 by not allowing them to move on. This is despite the fact that many of the different organisations within the 9/11 truth movement were actually started and driven by the families of the victims who want real answers and real justice for the murder of their loved ones. Dwain Deets: Former NASA Director of Aeronautics and core member of Pilots for 9/11 Truth, an organisation made up of many expert airline pilots and other pilots who have demonstrated conclusively that the aircraft involved in the events of 9/11 could not possibly have been the airliners alleged to have been hijacked and used. The data from the official 'Flight Data Recorders' and airline tracking data for those various flights completely contradicts the official story of 9/11 for every one of the four flights involved on that day. The evidence from these official sources makes each of those four flights impossible according to the official story of 9/11. Richard Gage, AIA: Founder and CEO of Architects & Engineers for 9/11 Truth, an organisation consisting of 1,700 professional Architects and Engineers, as well as 14,000 other individuals, who are calling for a new investigation into 9/11 to look at evidence that proves beyond reasonable doubt that the three towers which collapsed on that day could only have been brought down by controlled explosive demolition. Erik Lawyer: Founder of Fire fighters for 9/11 Truth whose organisation includes many first responder fire fighters on 9/11 and has exposed the blatant illegalities of the official investigation and the withholding of 118 eyewitness statements by first responder fire fighters, first responder police officers, and members of the public stating that they either saw or heard explosions going off in all three towers that collapsed, some of these explosions occurring moments BEFORE the first plane struck. Jake Jacobs: A current expert airline pilot with 30 years experience of flying exactly the same type of airliners as were allegedly involved on 9/11 and who outlined in his letter to the BBC how impossible the flight claims are for the official story of 9/11. He stated that what the BBC showed in their documentary in reference to the issue of the hijackers piloting the airliners was completely false, inaccurate, and impossible. Jake Jacobs is just one of numerous such expert airline pilots who have demonstrated exactly the same information in the past through the organisation 'Pilots for 9/11 Truth'. Each one of the above experts submitted to the BBC a letter supporting the three complainants and outlining in detail the substantial and incontrovertible evidence to support the assertion that the official story of 9/11 is impossible and requesting that the BBC do their job and show this evidence to the public. All four of these testimonies with the evidence that they contain can be seen here on this website using the links in the menus above. The three complainants also sought support from the public for this evidence to be shown by the BBC. As a result the BBC received nearly 500 messages in writing from the public from all over the world asking the BBC to look at the evidence presented and to show this evidence to the public. Following the BBC receiving all this evidence from the four experts and receiving nearly 500 letters from the public, the complaints reached the final stage of appeal by the BBC Editorial Standards Committee where they were deemed to be not even worthy of passing on to the BBC Trust Editorial Committee for their consideration. In short, the BBC was presented with a huge amount of incontrovertible scientific and factual evidence from numerous high level professional experts which completely disproves the official story of the crime of the century. This was backed up by hundreds of requests from the public, and yet all this was not even deemed worthy of being passed on to the BBC Trust Editorial Committee for their consideration let alone actually showing the information to the public who funds the BBC. All the letters of correspondence and evidence that went back and forth between the three complainants and the BBC throughout this process, including the testimonies and evidence presented by the four experts above, can be found the links in the menus above. Through their formal complaints process, the BBC has also been required to publish some of this evidence and correspondence on their own website through their monthly newsletter which documents information regarding formal complaints made to the BBC from the public (use the link below).